In I890s the book called "The Old Moscow" was put out in Russia and became a bestseller. The book was written by Mikhail Pylyayev, a staff writer for St.Petersburg’s newspaper The New Time. It was a story about the mode of life, customs and recreation of Muscovites in the 18th and early 19th centuries. The book is undoubtedly remarkable and it certainly attracted our attention. We offer an adapted part from the book which carries us to the end of the 18th century and features the coronation ceremony of Russian Empress Catherine the Great. Moscow has gone through many joyful and difficult days during the rule of Catherine the Great. It was a joy when she ceremoniously arrived in the city for coronation on September 13, 1762. Catherine the Great was moving in a carriage decorated with gold, which was followed by a suite all dressed in garments with embroideries in gold thread on them. People were shouting greetings. The coronation ceremony took place on Sunday. It was raining, but people began flocking to the Kremlin the day before the ceremony. There was a cannon salvo at 5 o'clock in the morning on the day of coronation. All persons who were to attend the ceremony began to arrive at the Kremlin Palace right after the salvo. Troops stood in lines in the Kremlin Cathedral Square at 8 o'clock in the morning. Sounds of trumpets and kettle-drum were heard at 10 о’сlock. Right after the salvoes the whole procession moved to the place of coronation at the Assumption Cathedral in the Kremlin. Meanwhile, after she got prepared in her private rooms for the sacraments of anointing and communion, Catherine the Great entered a large audience chamber. All regalia for her as the Empress of Russia had been brought there too. They were on the tables on both sides of the throne. When all state officials gathered, the Empress sat on the throne under a canopy. Meanwhile, her confessor began to besprinkle with holy water her upcoming road. As soon as Catherine appeared on the front steps of the palace, all church bells began to ring and cannons fired. When the Empress approached the entrance to the Assumption Cathedral, she was met there by a high clergy — more than 60 bishops and archimandrites were headed by the archbishop who offered the Cross for the Empress to kiss. The Metropolitan of Moscow besprinkled the Empress with holy water and she occupied the throne. She was in a scarlet garment of a monarch and also had the Order of St.Andrew pinned on her breast. It was the highest and the first Russian order introduced in 1698 by Peter the Great in honor of the Holy patron of the Russian state. This star-shaped order decorated with pearls and diamonds was shining on the Empress’ garment. When she was putting the crown on her head, cannons gave salvoes. After the ceremony all court’s officials offered their congratulations to the newly coronated Empress. Her departure from the cathedral was as ceremonious as her arrival. Troops greeted Catherine the Great with cannon salvoes while she was moving to the Kremlin’s Archangel Cathedral to give a bow to her deceased ancestors, and, afterwards, to the Annunciation Cathedral to put her mouth to the relics of the Russian holy persons buried there. When in the audience chamber again, Catherine the Great sat under the canopy and granted various favors to many persons. After that she moved to a luncheon to be given in the Faceted Chamber of the Kremlin. Singers and musicians were invited to perform during the luncheon. Tired by the ceremony, Catherine the Great returned to her private rooms. There were no solemn functions on that day any longer. But how festive was Moscow with lights of illumination! At midnight the newly-coronated Empress appeared on the front steps of her palace to admire the illumination. According to an eye-witness, Moscow was shining with fireworks all night through. Various shields were illuminated at the triumphal gates. One of the shields had an imitation of a flower which looked like the sun, and a mountain beneath with an inscription: “I will be seen by all people.” Another gate had a sword with an inscription “The law rules and the sword defends.” Still another gate had a hawk which carried lightning shafts and the inscription said: “Her Majesty's protection”… Magnificent fireworks took place across the Moskva River, opposite the Kremlin. On the sixth day after the coronation, Catherine the Great ruled to have festivities for common people. The festivities were held in Red Square and at the site of execution called Lobnoye Mesto. Various carriages decorated with gold moved along the streets on that day. Fried oxen, cooked game and freshly baked bread were heaped on them. These carriages were followed by carts with golden barrels full of mead and beer beverages. There were many tables with various meals in Red Square. Fountains were sprinkling with red and white wine. At crossroads of the main streets there were tables where the poor were treated with meals and beverages. Tents were set up near the Kremlin. They were decorated with many-colored flags. People were given cakes and sweets there. At other places acrobats, conjurers and Persian rope walkers were performing. Catherine the Great, accompanied by a large suite, was moving in а carriage along Moscow streets admiring the festivities. Meanwhile, heralds were throwing silver coins to people. The festivities in Moscow continued for a week. Later the Empress went to the Holy Trinity St. Sergius Monastery near Moscow. She was welcomed by the sounds of church bells and singing. After she visited the monastery's churches and put her mouth to the relics of dead saints, Catherine the Great heard wishes for long years of her rule. On her way to the private rooms prepared for her in the monastery, the Empress heard continuous cannon salvoes and sounds оf church bells. The clergy of the St Sergius Trinity Monastery greeted the newly-coronated Empress of Russia and wished a happy rule for her. After she saw the monastery inside and outside and got acquainted with its inhabitants, Catherine the Great went to Moscow also accompanied by cannons’ salvoes and sounds of church bells. After the coronation, Catherine the Great, contrary to expectations, did not leave Moscow for St.Petersburg, but spent a whole winter there. Moscow of those days witnessed unprecedented festivities and fancy-dress balls whose luxury seemed majestic like in a fairy tale. For example the first large fancy-dress ball was given late in February. It was called the Triumphant Minerva, who, as is known from the Roman Mythology, is the goddess of warriors and wisdom and the patroness of the arts and crafts. Those who organized the ball associated Catherine the Great with the name of this goddess. A printed poster announcing the ball said that it “will reveal the bad of the evil and the good of the merits”. The ball continued in central streets of Moscow for three days from 10 o'clock in the morning till late at night. Over four thousand people took part in it. Despite the cold autumn, people were looking out of the windows and standing on balconies and on the roofs of houses. The Empress was looking at the festivities moving along the streets in a carriage which was decorated with gold and driven by eight Neapolitan horses with colored cockades on their heads. The Empress wore a Russian national costume made of velvet and decorated with pearls, and a diamond diadem was shining on her head. Her carriage was followed by a long cavalcade of carriages carrying the suite. On the first day of this remarkable fancy-dress ball, an Italian opera was staged for the Empress and the court. For Fyodor Volkov, a famous Russian actor and the ball organizer, the ball was fatal. Riding astride to control the order during the festivities, he caught cold and died two months later. During the first few years of Catherine the Great's rule, several new buildings were erected in Moscow. One of them was church in Solyanka Street in the city center built to mark her coronation. The church still has "the place for the Empress" which was specially made for Catherine the Great. During the first year of her stay in Moscow, the Empress ordered the opening of an orphanage for children from poor families. It was the first ever orphanage in Moscow. Later, a hospital was built in honor of the recovery of Pavel, the heir to the throne. 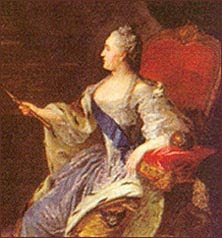 Two years after the coronation, Catherine the Great ordered a construction in Moscow of a second orphanage for children of poor families and a boarding house for their parents. The orphanage and the boarding house as one structure was built on April 21, 1764. Significantly, on the day of laying the foundation for the building over fifty poor brides were given dowries and given in marriage to craftsmen, and later, over one thousand poor people were given a lunch on that day to mark the charity of the Empress. In memory of the house’s foundation a special medal was minted. In 1771, famous industrialist Prokofy Demidov financed the foundation of a maternity house near the boarding house and the orphanage. He donated 200,000 rubles, a fabulous sum of money for those times. Using BullionVault you can buy physical precious metals by the gram at current exchange exchange rates. Create your free account now and get 4 grams of free silver as a welcome bonus.